Our clients come from a wide array of fields from individual artists, hunting outfitters to community organizations. Their web sites range from informative sites to e-commerce/database driven business sites. Below are a few of the businesses and organizations we have served since 1995. Our clients are located all over the world, from right here in Northwest Colorado to Canada and even South Africa. 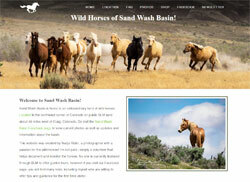 Sand Wash Basin, located in northwest Colorado is home to an iconic herd of wild mustangs. This website was set up to provide information and tips for safely visiting the wild horses. 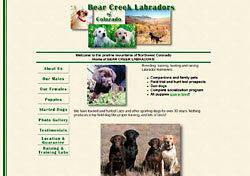 Laura Tyler and her team offer comprehensive dog classes and training programs in Northwest Colorado. She requested a "doggie" themed site that is easy to navigate. 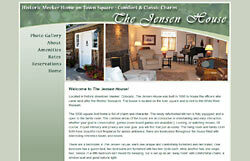 Located in historic downtown Meeker, Colorado, The Jensen House was built in 1880. In recent years it was converted to a vacation rental. It was important to the owner that the website capture the history and "feel" of this lovely historic home. 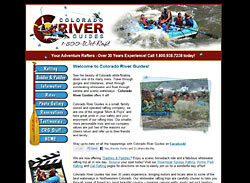 Rafting and fishing trips on the Colorado and Eagle Rivers in Colorado. 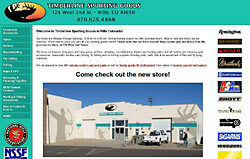 Sporting goods store located in downtown Rifle, Colorado. Showcasing the large variety of inventory for hunting, fishing, shooting sports and outdoor recreation. Labrador Retrievers in all colors from the finest field trial champions. Showcases the exceptional elk hunting offered in the remote northwest corner of Colorado. 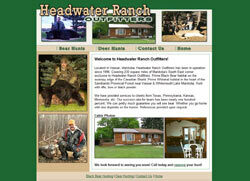 Specializing in high quality, full service hunts for black bear and whitetail deer in Manitoba, Canada. A Montrose Colorado ranch offering guiding and outfitting services for elk and mule deer on private land.